Baralgin - analgesic and antipyretic, belonging to the group of non-narcotic nonsteroidal agents. It has analgesic, antipyretic and mild anti-inflammatory effect. Baralgin released in tablets (10 tablets in a blister), in packs of 10, 20, 50 and 100 tablets. The main active ingredient is metamizole sodium. 1 tablet baralgin contains 500 mg of metamizol. Auxiliary components: magnesium stearate, macrogol. Until 2009, the drug Baralgin was registered in the country, which consisted of 3 active ingredients - metamizole sodium, pitofenone, fenpiverinium bromide. Since 2009, Baralgin M, containing only one active ingredient, metamizole sodium, has been registered and approved for dispensing through the pharmaceutical network. Pharmacodynamics. Metamizole belongs to the group of non-narcotic analgesics, derivatives of pyrazolone. It is characterized by analgesic, antipyretic and weak anti-inflammatory effects. The mechanism of action due to the inhibition of the synthesis of prostaglandins (they take part in the development of the painful and inflammatory process) is similar to the effect of other non-narcotic analgesics. Pharmacokinetics. Metamizole is rapidly absorbed in the gastrointestinal tract, is broken down in the liver to the active metabolite. About 50–60% of the active substance is bound to plasma proteins. Excreted mainly by the kidneys. The half-life is 2.7 hours (in patients with cirrhosis of the liver, this figure increases to 10 hours). At therapeutic concentrations, the drug is absorbed into breast milk. smooth muscle spasm (with intestinal, hepatic and renal colic, spasms of the bladder and ureter). in the I and III trimesters of pregnancy. The recommended dosage of Baralgin for adults is from 0.5 g to 1 g (1-2 tablets), the frequency of application is 2-3 times a day. The maximum daily dosage should be no more than 3 g (6 tablets). The tablets are taken whole, washed down with enough water. The duration of treatment should be no more than 3 days when used as a febrifuge and no more than 5 days when used as an anesthetic. allergic reactions - a rash on the skin, mucous membranes of the nasopharynx or conjunctiva, angioedema , bronchospasm, anaphylactic shock (very rare). With the development of anaphylactic shock, emergency medical care is required - slow intravenous administration of an adrenaline solution (if necessary, repeated after 15 to 30 minutes). Then glucocorticoids and antihistamines are introduced, the blood volume is replaced, and the heart is massaged. When Baralgin is taken, agranulocytosis can develop, which is manifested by a deterioration in the patient’s general condition, fever, inflammation of the oral mucosa and nasopharynx, and increased ESR. Symptoms of thrombocytopenia are point hemorrhages on the skin and / or mucous membranes, increased tendency to bleeding. If signs of thrombocytopenia or agranulocytosis occur, Baralgin should be discontinued. An overdose of the drug causes nausea and vomiting, hyperthermia, convulsions , stomach pain, decreased blood pressure and tinnitus, drowsiness, shortness of breath, tachycardia , impaired consciousness, paralysis of the respiratory muscles. When these symptoms appear, gastric lavage, the appointment of saline laxatives and sorbents, and forced diuresis and hemodialysis are required. With the development of convulsive syndrome, diazepam and high-speed barbiturates are injected intravenously. Baralgin should not be taken in high doses in patients with impaired liver and kidney function. impaired peripheral blood (including after treatment with cytostatics). when drinking alcohol while taking Baralgin, the toxic effect of alcohol and the drug is enhanced. The drug can be administered to pregnant women in the second trimester (from 4 to 6 months) only under strict indications. When used during lactation, breast feeding should be stopped for 48 hours after taking Baralgin. Structural analogue of Baralgin, containing the same active ingredient, is the drug Analgin. By a similar mechanism of action, but having a different composition, drugs include: Antipyrin, Baralgetas, Quintalgin, Maksigan, Spazmalin, Tetralin, Bralangin, Revalgin. The drug is stored in a dry, protected from sunlight and out of reach of children at room temperature (from 8 ° C to 25 ° C). Shelf life is 4 years. Tablets should not be taken after the expiration date indicated on the package. 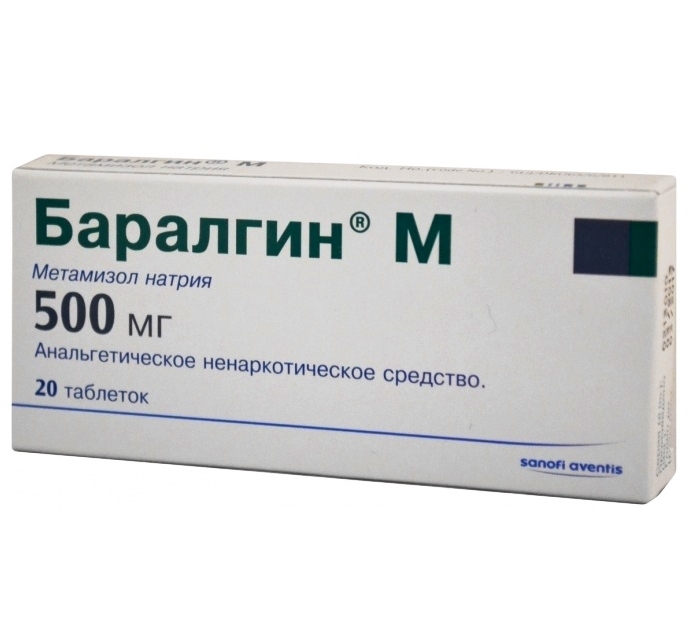 Baralgin M tablets 500 mg, 20 pcs. - from 183 rubles.